The Foxall® is an automated casting cleaning cell that is easy to program and is ideal for high casting throughput and fast part changeover. The success of the Foxall® cell is due to the adaptable, robust design that uses only proven technology. This foundry-duty system is compatible with a variety of materials including: aluminum, brass, bronze, iron, steel, etc. 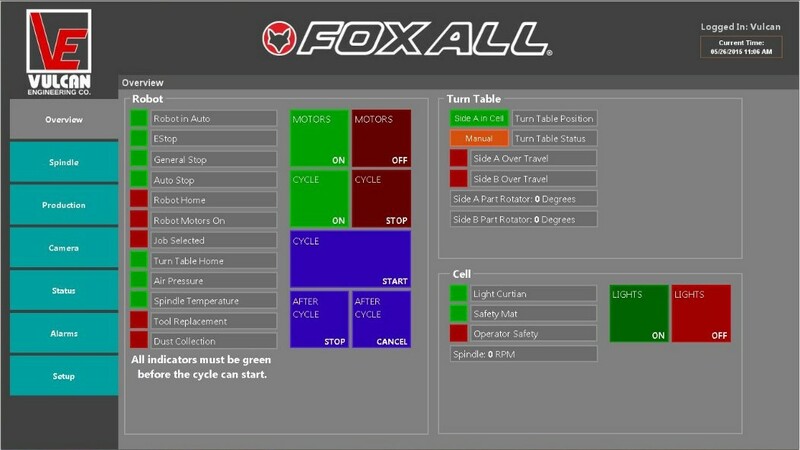 Vulcan has recently made several updates to the Foxall® with new system controls and an operator interface that is more user-friendly than ever. This system has always offered simple programming (online or offline), but now software updates make it more efficient and easier to use. The operator interface features a touch screen HMI where the operator can access Equipment I/O status, Recipe Management, Alarms and PM reminders, Password Protection, and has the ability to connect to the customer’s network. Another advantage is Remote Online Diagnostics which permits Vulcan real-time remote access to the control system and all parameters/programs. This simplifies diagnostics and support while minimizing down-time. An optional Force Control Function allows the next level of adaptability and optimization. 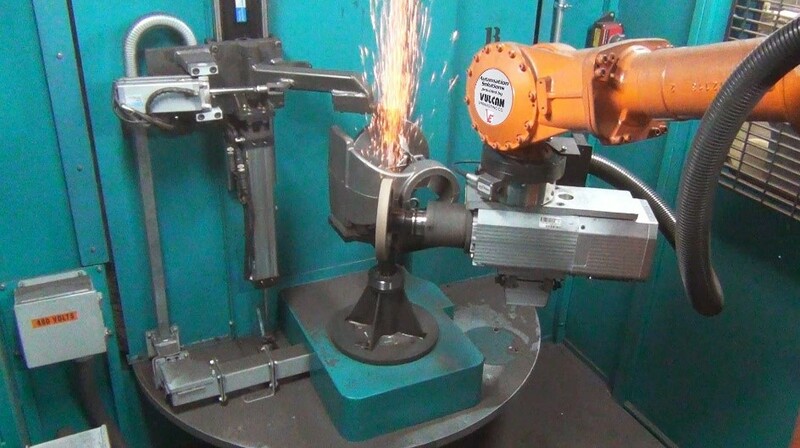 This tool improves grinding efficiency by using a force/torque sensor mounted between the robot and the spindle. Now the system can automatically change TCP speed in response to feed force, therefore improving material removal rate and accuracy. Self-contained construction and simple utility hookup that allows for easy relocation with no calibration or re-teaching necessary to restart production. Together these updates and the existing technology allows several advantages such as monitoring of machine and operator performance through information such as production numbers and cycle times. It is also simple enough to use that operators can be trained in just a few hours. The improved control system, in addition to its already flexible design, makes the Foxall® one of the best options on the market for automated casting finishing cells.